A recent report released by the Robert F. Kennedy Memorial Center for Human Rights is capitalizing on the winning campaign slogan of “moving forward” by re-elected President Leonel Fernandez. The report entitled “Dominican Republic: Time to Move Forward on Resolving Statelessness” reviews the current situation of legal limbo of hundreds of thousands of men, women, and children being denied citizenship in the Dominican Republic against Dominican law. A growing number of Dominican citizens are under investigation for deportation because of their Haitian ancestry. In March 2007 the Dominican government issued Circular No. 17, a directive requiring registry offices to investigate any birth certificates that had been issued “irregularly” to children of foreigners “who had not proved their legal residence or status in the Dominican Republic.” In practice this circular is being used to de-nationalize Haitians’ descendants, as registry offices are equating being of Haitian descent with fraud. 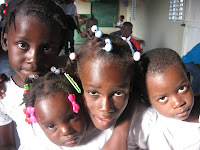 These investigations lack due process, and recent experience at Batey Libertad and other communities working within the broad consortium of Fundacion de Libertad confirm the systematic denial of citizenship, for example, the denial of national identification cards (cedulas) to Dominican born and raised young men and women. Entry filed under: Batey Libertad.